Marketing is an every day and year-round campaign. 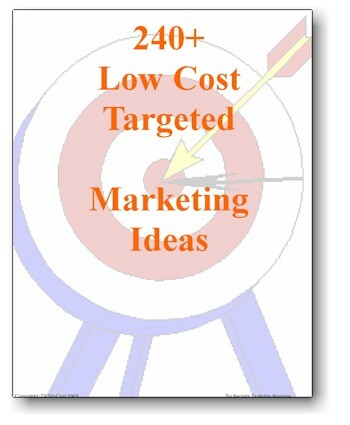 This short, concise volume contains over 240 time-tested, field-tested and easy to use marketing ideas that won't cost you a fortune to implement. Build your company's image with community involvement, fund raisers and special events. Direct mail letters for tune-ups and replacements. Also included is a direct mail letter section for you to use and adjust to your offer. SEE THE SPECIAL OFFER BELOW! NOTE: Tom McCart died of Lou Gehrig's Disease on June 10, 2004. ALL of the proceeds from the sale of Tom McCart products go to his family to pay for his medical and long-term care expenses. To date, the sale of these products has raised over $100,000. 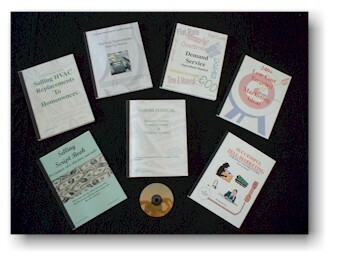 Order the entire Tom McCart Library of all seven books for only $499 $299 (plus shipping & handling) and get a FREE copy of "From the Sky Up: the Tom McCart Story on DVD! THAT'S OVER 30% OFF THE NORMAL PRICE! To take advantage of this special, limited time offer, click on the "Add to Cart" button or call 1-800-963-HVAC (4822). Orders typically ship the following business day. Read Charlie Greer's Retrospective of Tom McCart.